Sardines are clear winners, whether grilled by a home cook and served on salad or prepared by a great chef. I like almost everything about sardines. I like to cook them, I like to eat them. Heck, when I visit aquariums I even like to watch them swim around in circles. That’s the only explanation I can offer for how I found myself standing on a stage last month engaged in a cook-off with one of America’s great chefs. In the final night of this year’s Taste event, Michael Cimarusti from Providence and I were engaged in what we decided to call the Great Fish Fight, and the subject was sardines. He won, of course – I told him at one point it was like me playing H-O-R-S-E with Kobe Bryant – but I did get to cook some sardines, so the event wasn’t a total loss on my part. 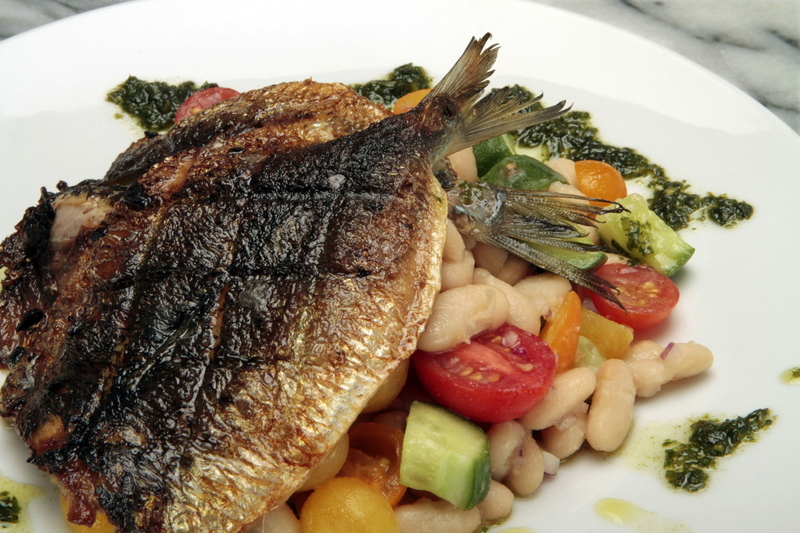 The finished product: grilled sardines atop a white bean salad with pesto. The whole thing started innocently enough at last year’s Taste when food blogger Sara O’Donnell (Average Betty) tried to instigate an argument between Cimarusti and me about who had the better beard. No vote was taken, but I do think I won by a landslide as people tend to favor elegance over volume. When she tried to kick up a similar fuss this time around, Cimarusti – perhaps chastened after last year – suggested that, instead, we should have a sardine cook-off. “Fish-ticuffs” I called it. And, of course, since the whole thing played out in real time on Twitter, there was no way I could back down. In good times, sardines are one of the great bargains in the fish market – usually around $2 a pound. We’re in a down cycle for sardines, so I was stymied when I tried to sneak in a little practice beforehand. All my usual suspects, where sardines have been so plentiful in the past, turned up dry. I ended up using a sardine-like fish I found at a seafood store called something like “roundhead scad.” At least I got some practice cleaning – and it actually tasted good. Cleaning is a big part of sardine cooking. Unlike most fish you buy in the market, sardines are always sold in the round and in their entirety. Cleaning them is not hard, but it is not like buying the usual fillet. Think of it as the difference between cutting up a whole chicken and buying a boneless, skinless breast. I find sardines react really well to grilling and pair well with big flavors. When I cook them (and maybe I learned this from Cimarusti, years ago – I’ll give him credit anyway), I like to grill them on the skin-side only until the flesh turns color all the way through. This way the skin crisps up nicely, a real plus. As far as accompaniments, with it being the height of the summer harvest, I decided to pair them with a salad of tomatoes, cucumbers and white beans, served with a nice drizzle of a quickly made pesto. It was like a panzanella, but with firm beans instead of tender bread. Cimarusti opted for another of my favorite sardine dishes, the Sicilian classic pasta con le sarde – sardines mixed with spaghetti, wild fennel fronds and bread crumbs. And he knocked it out of the park. The judges – “Good Food” radio host Evan Kleiman and food writer Jonathan Gold – were kind, but it was clear that this was a perfect example of the difference between a good home cook’s dish and what a master chef like Cimarusti can do. Still, all was not lost – I did get what I think of as my Little League “hardest trier” award. Afterward Cimarusti gave me all the leftover sardines we hadn’t cooked. So the following night, I grilled them. Defeat has never tasted so sweet. 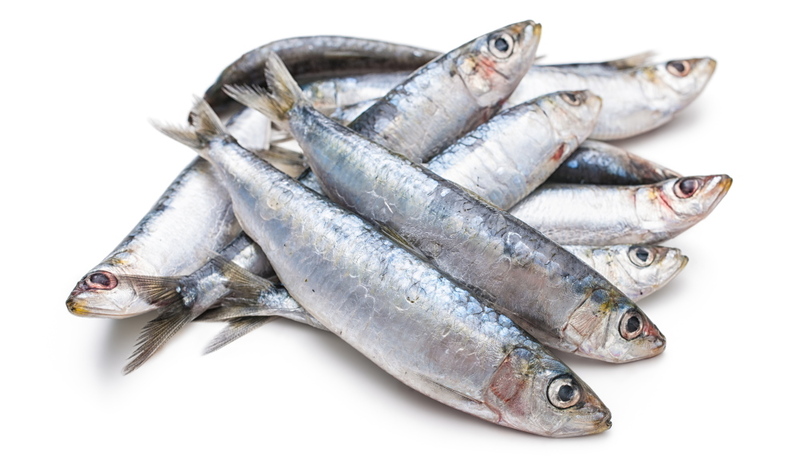 Cleaning sardines isn’t difficult if you follow a few simple steps. After you’ve done a couple of them, it should take no more than a minute. Begin by laying the fish on a board and making a small cut on the back, right behind the head and straight down through the backbone. Make another incision on the belly side just behind the front fins. Holding the fish under running water, gently twist the head from the body. If you do this right, most of the innards will come away with the head. Discard these. Cut a slit the length of the belly and rinse out the inside. Lay the fish on its back on the cutting board and make two shallow parallel cuts the length of the backbone. You’ll want to be careful not to cut all the way through the meat. Grasp the exposed backbone near the tail and pull up, using the fingers of your other hand to hold the meat in place. The backbone and larger ribs should lift cleanly away, leaving you a neatly butterflied fish. Finish cleaning by scraping away the black skin along the belly and cutting away the rib endings on either side. There will still be some bones left, but these will be so fine they won’t be a problem. Do check to make sure all of the bones around the collar of the fish are gone. Finally, square up the top to make a neat double-fillet. In a bowl, whisk together 1/4 cup olive oil with minced garlic, crushed red pepper and the juice of one-half lemon. Lightly salt both sides of each sardine, and then brush both sides with the olive oil mixture. Set aside. Empty both cans of beans into a strainer and rinse under running water until the water runs clear. Set aside to drain thoroughly. Cut each of the tomatoes in half and place in a large work bowl. Trim the ends of the cucumbers, cut in lengthwise quarters and then in half-inch pieces, and add these to the tomatoes. Add the red onion, the drained white beans and 1/4 cup olive oil and stir gently to mix well. Season to taste with salt and black pepper. To make the pesto, drop the garlic cloves through the feed tube of a running food processor or blender and mince until fine. Turn the machine off and add the basil leaves. With the machine running, slowly pour 2/3 cup olive oil through the food tube to make a smooth flowing sauce. Season to taste with salt. Heat a grill or a stove-top grill pan over medium heat until hot. Shake any excess olive oil mixture from the fish before grilling. Brush the grill pan with olive oil and place the sardines on the grill, skin-side down, and cook on one side only until the color has changed all the way through, 5 to 7 minutes. Reduce the heat as needed if the fish begins to darken too quickly before it cooks through, and cover the pan with a lid to concentrate the heat if the fish cooks too slowly. When the sardines are done, squeeze the remaining half lemon over the flesh side. Divide the white bean salad evenly among four to six plates. Arrange the sardines on top, skin-side up. Spoon pesto in a ribbon over the sardines and salad and serve immediately.